I don't get a chance to read many Francophone or Lusophone novels, unless they're translated into English. So when I get a chance to read one, I get excited. I read Houseboy last summer as part of my summer read for my thesis, and it was a great, short read. 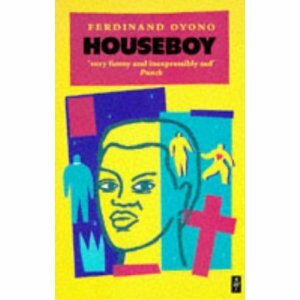 'Houseboy' is written in the form of a diary kept by Toundi, an innocent Cameroonian houseboy who is fascinated and awed by the white world, the world of his masters. When the head of his mission is killed in an accident, Toundi becomes the 'boy' of the local Commandant. In an effort to improve himself, Toundi studies his new world closely---too closely. Gradually his eyes are opened to its realities, and in the end it destroys him. Getting everything from Toundi's perspective, we get to see the relationship that existed in the colonial era between Cameroonian's and their French colonial maters. It was simultaneously funny and sad. I would recommend it to all.